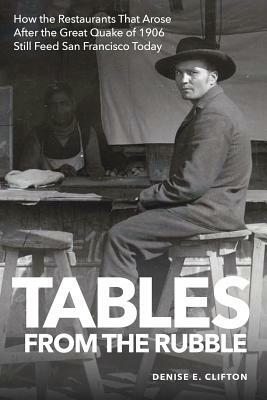 TABLES FROM THE RUBBLE transports readers to San Francisco in the years just after the Great Earthquake of 1906. Amid the ruins, restaurants rose to feed the hungry and lead the recovery. Today, a handful of the restaurants that opened in those boom years remain - some still serving customers in the same spaces where they first opened, offering food and drinks with a direct link to a century-old past. TABLES FROM THE RUBBLE tells the stories of restaurants like Swan Oyster Depot, Liguria Bakery, Comstock Saloon, the Palace Hotel, the House of Shields, John's Grill and Schroeder's. And it follows the journey of Chinatown's Sam Wo, which was saved by the hard work of one family and an entire community committed to the historic restaurant's legacy. Denise E. Clifton is the founder of Tandemvines Media, a multimedia company that works with organizations and authors to create stories that are multidimensional experiences. She is committed to crafting narratives that encourage readers to explore. Denise writes about food history and is especially drawn to stories that teach about the evolution of a place through its food. She is passionate about using these compelling tales to help others connect to these special locales. While researching the restaurants featured in Tables From The Rubble, she learned about San Francisco's Italian and Chinese immigrants, neighborhood development, the boxing world, and Prohibition history. She also explored the unique challenges faced by families whose businesses span generations - as well as the stories behind different types of focaccia, raw-fish salad, Green Goddess salad dressing and bloater toast. Oh, and she ate very well - though admittedly she hasn't tried the bloater toast. Yet. Denise worked as a designer, editor, art director and department head for 20 years at the Seattle Times. She has been recognized with multiple awards for her design, including iBook of the Year for 2016. She was a Stanford University Knight Fellow in 2004-05.